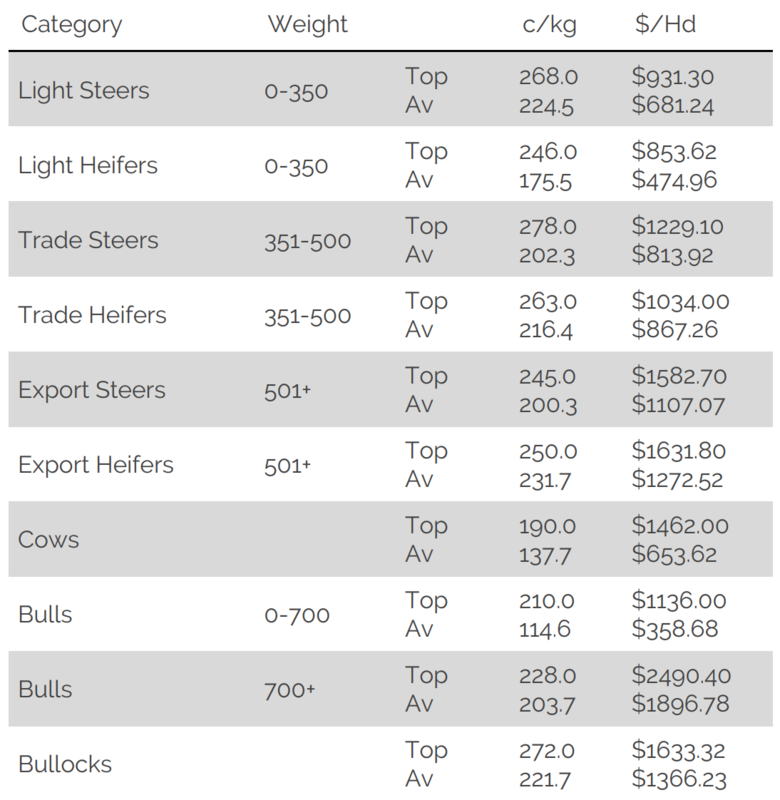 A similar sized yarding to that of the last regular sale held two weeks ago due to the Australia Day public holiday contained a mixed but mainly good quality offering. A regular following of buyers attended and generally paid firm prices for the better quality in each category but discounted the plain to average quality. Most were slightly cheaper but odd sales were 20c to 40c/kg different at times for the same article. The few vealers that were penned sold from 210c to 268c/kg. Yearling steers to the trade made between 180c and 278c with the heifer portion to 250c and restockers paid to 258c/kg to secure their yearling supplies. Most C3 and the odd C4 grown steers made 225c to 245c with 2 select quality pens at 270c and 272c/kg. The D2 grade of manufacturing steers were from 170c to a top of 193c/kg. The bulk of the C muscled grown heifers were from 215c to 250c/kg. The E1 cows ranged from 58c to 110c with the D1 grade from 120c to 160c/kg. The D2 cows were between 140c and 178c with most C and D, 3 to 5 score beef cows from 170c to 190c/kg. Heavy weight beef bred B2 bulls made 205c to 228c/kg.